PHUKET, Thailand – In the chaos after Asia’s killer tsunami, a volunteer Israeli doctor and a badly injured survivor fell in love. A year later, Israeli-born businessman Ron Bombiger held Dr. Dorit Nitzan’s hand and proposed on Tuesday in the Phuket hospital room where they first met. “Dori, in front of all these people, will you marry me?,” asked Bombiger, 49, as beaming nurses looked on in the room adorned with red roses and petals on the bed in the shape of a heart. She whispered in his ear, they kissed and exchanged engagement rings to loud cheers and applause. The two met days after the tsunami shattered Bombiger’s hotel on Kamala Beach on the Thai tourist island of Phuket. Thais gave Bombiger, who was visiting from Los Angeles, a blanket and rushed him to the island’s main Bangkok Hospital with a serious leg injury. Nitzan, a member of the Israeli team sent to Thailand to help survivors, visited Bombiger as he spent the next few weeks in room 432, recovering from six operations on his right thigh. They discovered they had lived as children in the same town in Israel. 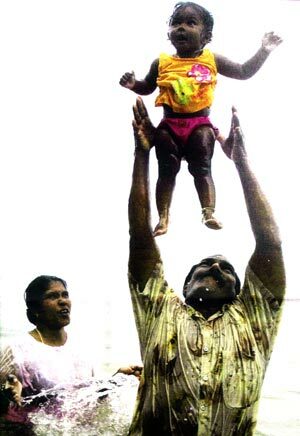 SHE was just 22 days old, fast asleep on a mattress, when the tsunami waves hit the shoreline of Miami Beach in Penang. Before her parents could do anything, she had disappeared from view. 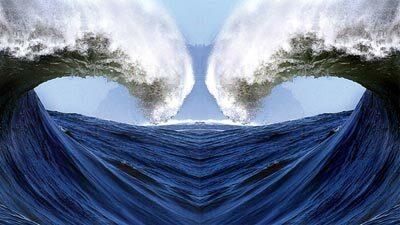 But miraculously, the next round of waves brought her back. 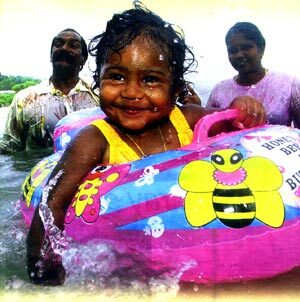 This is baby Thulishi, who now just loves being in the water, under the watchful eyes of her parents, father Suppiah Alagappan and mother Annalmary Lurdu. Statistically, Thulishi is just one of the many lives affected by the region’s most horrific natural disaster. But in her smile, she radiates hope. “SHE must have been saved for a reason. Maybe she would be the next Mother Teresa or something,” said Alagappan of his miracle baby who celebrated her first birthday on Dec 4. The tiny tot is now a chubby, curly-haired toddler who stares wide-eyed at visitors. Her family has been given a unit at the tsunami transit homes in Batu Ferringhi and Thulishi spends most of her time in a white cot filled with toys from well-wishers at the cafe where she nearly lost her life a year ago. Lulled to sleep by the sound of waves daily, Thulishi shows no fear of the water and loves playing in the sea. “She keeps tugging our sleeves to take her for a walk on the beach when she wakes up. And she’s such an early riser!” said Alagappan, 57, who lovingly calls his daughter darling…. 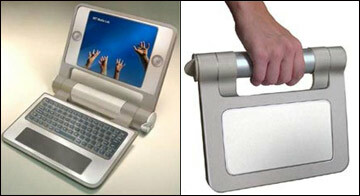 DECEMBER 11, 2005 (REUTERS) – Potential computer users in the developing world will not want a basic $100 hand-cranked laptop due to be rolled out to millions, chipmaker Intel Corp. Chairman Craig Barrett said Friday. Schoolchildren in Brazil, Thailand, Egypt and Nigeria will begin receiving the first few million textbook style computers from the Massachusetts Institute of Technology (MIT) media lab run by Nicholas Negroponte in early 2006. United Nations Secretary General Kofi Annan has welcomed the development of the small, hand-cranked lime-green devices, which can set up their own wireless networks and are intended to bring computer access to areas that lack reliable electricity. Celebrity inventor Trevor Baylis has said he is “not convinced” that Nicholas Negroponte has got very far with the $100 laptop he is developing for the Third World. Baylis, who invented the clockwork wireless radio, was recently invited to MIT Media Lab to meet Negroponte and see the prototype, but said that it “could have put together with a Lego kit”. “Nothing worked. I was expecting him to show me the screen in action or the wind-up feature, but I saw nothing but a basic prototype,” he said. Baylis clearly has a lot to contribute to the project as he invented a wind-up radio that is now used widely in the Third World. 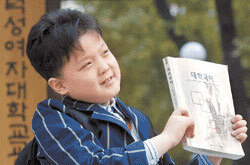 He also lays claim to demonstrating the world’s first wind-up computer. 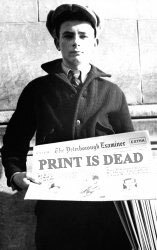 Baylis believes he could develop wind-up technology for the MIT laptop but questioned whether such technology is currently available. Lee Felsenstein, designer of the Osbourne computer, is working on a similar wind-up computer project. The details are on his blog here. Meanwhile the US National Science Foundation is funding the Technology and Infrastructure for Emerging Regions project at the University of California, Berkeley. Michael Robertson, chief executive at open source firm Linspire, said that his company has researched the viability of the project and has deemed it inadequate. Once a month an article comes out talking about a $100 PC. Most recently MIT, with a coalition of backers, is talking up an economical PC as a digital necessity for emerging markets. As you probably know, I’m a huge advocate of low-cost PCs, but the $100 computer as conceived today will be a failure. The specifications I’ve seen for an ultra-low-cost PC are woefully underpowered and unable to perform common computing duties and will be rejected by the intended beneficiaries. Rebecca: Excuse me, I’m Rebecca Demore from the homeless shelter. Rebecca: Are you the ones leaving the muffing pieces behind our shelter? Elaine: You’ve been enjoying them? Elaine: Well they’re perfectly edible. Rebecca: Oh, so you just assume that the homeless will eat them, they’ll eat anything? Rebecca: I know what you thought. They don’t have homes, they don’t have jobs, what do they need the top of a muffin for? They’re lucky to get the stumps. Elaine: If the homeless don’t like them the homeless don’t have to eat them. Rebecca: The homeless don’t like them. There’s a great analogy from the muffins to low-cost PCs. Well-intentioned advocates are offering a muffin stump of a computer to the “digital homeless”. Those with the top-of-the-muffin computers are expecting others to be satisfied with just email and other lightweight tasks. Recently, Linspire did some research in several developing PC markets. We traveled around the globe to see how poor people are using PCs. The results were astounding. We saw homes without running water with a very capable PC in one corner that the whole family would use. This wasn’t a low-end PC, but a middle-of-the-road machine that the family used for surfing the Internet, playing games, watching movies, listening to music and educating their children. To buy the computer, the family would take out a loan for $250-$400 and often assemble their own computer (or have it assembled by friends). They did not buy the cheapest computer available to them, but instead insist on getting a fully functioning computer. To put it another way, they are making a decision to take out a loan that takes several years to repay rather than have a computer “stump”. They recognize all the benefits a computer can bring, and they want it all and are willing to make sacrifice to get it. They are not content with an email-only or feature-limited solution. Don’t get me wrong, I’m a huge advocate for ultra-low-cost computers (ULCC). Over the last few years Linspire, along with our OEM partners, has blazed a trail of low-cost computers. We started with the $299 PC, then the $199 PC and the $169 disk-less Webstation. On the laptop front it started with a $799 laptop and late last year culminated with a $498 laptop from Walmart.com. We continue to do great business through partners like Sub300, who offer low-cost computers without any rebate gimmicks. 1) Even poor people will hold out for a complete muffin, rather than a stump. 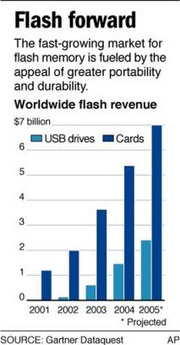 Although it’s tempting to try and hit a magic price point like $100 – which is really just an arbitrary number given the US dollar conversion – and ship a slow, memory-constrained computer, it is likely to be rejected by its intended beneficiary. Better to ship a reasonably performing computer, even at a slightly higher price. In our experience, this means a minimum of 800MHz computer with 256MB RAM with a 10GB hard disk. 2) Ease of use is critical. A computer that is low cost but too difficult to use will disappoint customers. This is why Linspire has dedicated so much engineering to make the first version of Linux that does not require the command line to operate. (Of course you can still use it if you prefer, but it’s not required.) We’ve also made sure to include audio-assist interactive tutorials, a fantastic printed manual and self-running demonstration mode. I look forward to the day when a $100 computer is a reality. And I believe that the MIT initiative and others can bring new innovations to the business that will cut the costs. (The display technology MIT is working on is fascinating.) But it would be a mistake to champion a computer stump when what the world needs and wants is a complete muffin. 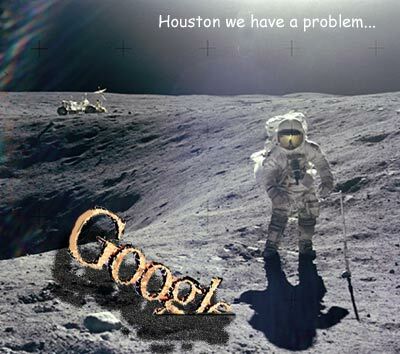 NASA and Google have signed a MOU to cooperate on large-scale data management, massively distributed computing and bio-info-nano convergence. Google will also develop up to one million square feet within the NASA Research Park at Moffett Field — sounds more like a stronghold, than a foothold. Now that NASA has ceded all its precious information to the fastest-growing corporation in the world, can we hope that they will find alien life in there somewhere? 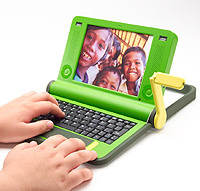 A notebook for every child at US$100 a pop? Sounds crazy? MIT Media Lab guru Negroponte is pushing forward with this idea. It should be out in November, he says. The tail-end of this story addresses the real-world realities. Negroponte says his team is addressing ways this project could be undermined. For example, to keep the $100 laptops from being widely stolen or sold off in poor countries, he expects to make them so pervasive in schools and so distinctive in design that it would be “socially a stigma to be carrying one if you are not a student or a teacher.” He compared it to filching a mail truck or taking something from a church: Everyone would know where it came from. And unlike the classic computing model in which successive generations of devices get more gadgetry at the same price, Negroponte said his group expects to do the reverse. With such tweaks as “electronic ink” displays that will require virtually no power, the MIT team expects to constantly lower the cost. You got that right bro. And boy do you NOT get business realities. The specs for the product is limp at best. 500MHz processor running on Linux with flash memory storage of 1 GB? Ho hum. Great choice of countries. Watch China clone the machine in five minutes if there is a demand. And watch Thailand, Brazil and S. Africa ship half of it to other countries at profit. In the second year — apparently — when Massachusetts Gov. Mitt Romney hopes to start buying them for all 500,000 middle and high-school students in this state — Negroponte envisions “100 million to 150 million being made.” He boasts that this would surpass the world’s existing annual production of laptops, which is about 50 million. Yeah, and so Dell, HP, Apple, Toshiba, Acer, Lenovo, and every other major brand on this planet will just be sitting on their hands watching the carpet go from under their feet. And we’re not even talking about horrendous service problems these machines may be faced with. 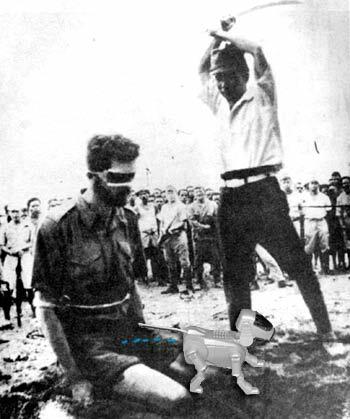 Nice try Mr Negroponte, but this pig just won’t fly. Sony’s Howard Stringer has done the American thing. When you can’t fix it, slash and burn. It was just a matter of time, as we suggested in March. The new head of Sony, maker of Walkman portable music players and PlayStation game consoles, introduced a plan on Thursday for turning around the struggling Japanese electronics giant that will cut 10,000 jobs – about 6.5 percent of its work force – as well as shed unprofitable products and centralize decision-making in the sprawling group. But in a possible sign of rough waters still ahead, Sony said it expected to post its first annual loss in more than a decade this year. The company said it now foresaw a loss of ¥10 billion, or $90 million, for the fiscal year ending March 31, 2006, down from a previously forecast $90 million profit. The chief executive, Howard Stringer, released his widely awaited turnaround plan in his first news conference since June, right after taking the helm at Sony. He promised to return Sony to profitability next year, saying the job cuts, product eliminations and other steps like factory closings would save almost $2 billion over the next two and a half years. But he said that cost-cutting alone was not enough to ensure Sony’s future. The plan also included organizational changes aimed at improving communication between Sony’s notoriously autonomous divisions. Stringer said he hoped this cross-fertilization would lead to new products, allowing Sony to stay ahead of low-cost rivals in China and South Korea, which are quickly climbing up the technology ladder. “We must be like the Russians defending Moscow from Napoleon, scorching the earth ahead of our competitors,” he told reporters.